The brokerage conducts property management? If you answered NO, skip to the “Additional Explanation“ section on Page 8. If you answered YES, continue with this section and list the number and type(s) of properties managed. (C) Specify a beginning and an ending date. (B) Be signed by the property owner or his agent and the property management firm’s designated broker or the broker’s authorized real estate licensee. (A) State all material terms and conditions of the property management firm’s services, obligations, duties and responsibilities to the property owner. (D) Contain cancellation provisions that are agreeable to both parties. (E) Provide for the manner of disposition of all monies collected by the property management firm, including any tenant deposits. (I) State the terms and conditions of compensation the property owner pays for services pursuant to the property management agreement. State all terms and conditions of the property management firm’s services, obligations, duties and responsibilities to the owner. (F) Specify the type and frequency of status reports to the owner. (G) State the amount and purpose of monies the property management firm holds as an operating reserve for emergency and other purposes. (A) Contain an automatic renewal provision, if the property management firm sends the owner a reminder notice at least thirty days before the renewal date. The notice does not negate any other cancellation term otherwise agreed to. (B) Provide for reasonable liquidated damages or cancellation fees for early termination of the agreement. (C) Allow the property management firm’s broker to authorize a licensed or unlicensed person in the direct employment of the broker, pursuant to section 32-2174, subsection C, to transfer monies from or to be a signatory on a property management trust account to which the property management firm deposits the owner’s monies. Provide for liquidated damages or cancellation fees for early of the agreement. 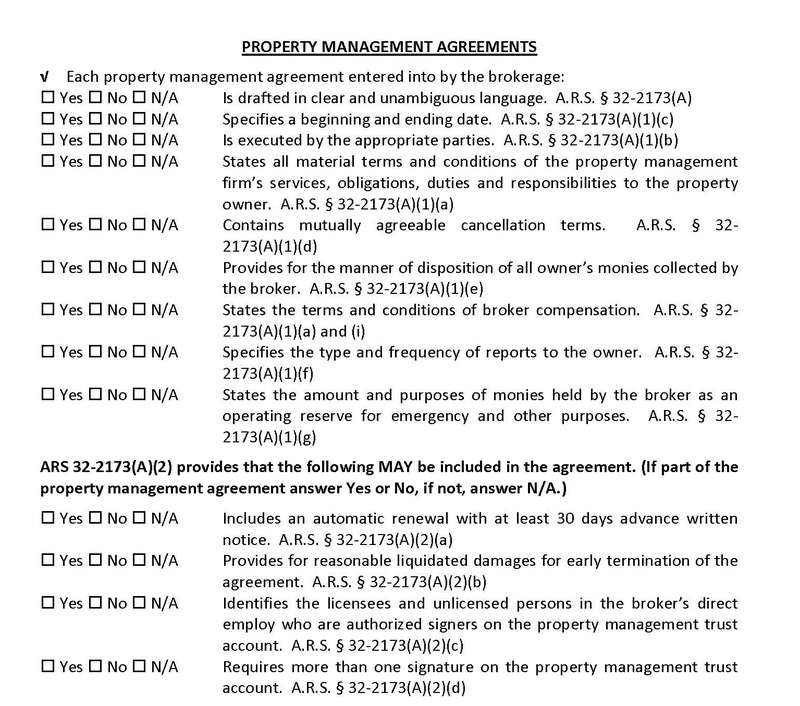 (D) Require more than one signature on checks written from a property management account. In light of significant credit problems, the tenants offered to pay a full year’s rent in advance if the landlord would accept them as tenants. The landlord ultimately accepted and the parties entered into an AAR Residential Lease Agreement. The tenants took possession and paid the entire year’s rent in advance. Is the property manager required to hold the rent in the brokerage trust account to pay the landlord on a monthly basis? Based on the facts presented, the parties agreed in the lease that the full year’s rent would be paid to the landlord. Accordingly, there is no obligation for the property manager to maintain the rent in the brokerage trust account. Rather, the rent should be forwarded to the landlord as the parties agreed. NOTE: A lease owner is not permitted to demand or receive security, including prepaid rent, in an amount in excess of one-half month’s rent. However, a tenant is not prohibited from voluntarily paying more than one-half month’s rent in advance. The brokerage represents the landlord. The tenant has requested to pre-pay all rents at the beginning of the lease term. 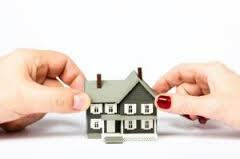 Can the brokerage deliver the pre-paid rent to the landlord, or must the brokerage hold the money in trust in the event the landlord breaches its obligations under the lease (i.e., the property is foreclosed during the lease term)? A manager does not have an obligation to hold pre-paid rent in trust in the event the landlord breaches the . The residential property was foreclosed and the bank took title by way of a trustee’s sale. The tenant occupying the property was not aware of the Trustee’s Sale and continued to pay rent to the prior homeowner’s property management company. In fact, the tenant paid two months of rent after the trustee’s sale to the property management company. What should the property management company do with the post-trustee’s sale rental payments? Broker, as a property manager, represents the landlord of a luxury residence. During a property visit, the broker discovers that the tenant, who is not represented by a real estate agent, is cultivating 12 marijuana plants inside the residence. Tenant was appropriately qualified for the tenancy and is not delinquent or otherwise in breach of the lease agreement. What is the appropriate course of action for the broker? Also, what rights and remedies does the landlord have? The broker should immediately notify the landlord of the tenant’s cultivation of marijuana on the leased premises. The landlord’s rights and remedies are not as clear. This response assumes that the tenant is properly approved as a medical marijuana cardholder through the Arizona Department of Health Services. If the tenant is not a cardholder, the answer is simple—the landlord can immediately evict the tenant and pursue an accelerated eviction proceeding if the tenant refuses to vacate the property. By engaging in “drug-related criminal activity,” which would include the unlawful possession or cultivation of marijuana, the tenant would be in violation of lines 160-164 of the AAR standard-form Residential Lease Agreement. The Residential Lease Agreement specifies that such activity permits the immediate termination of the tenancy. Similarly, Arizona’s Residential Landlord Tenant Act provides for the immediate termination of a tenancy and an accelerated eviction process as a result of the tenant’s unlawful possession of a controlled substance. A.R.S. §§ 33-1368(A)(2), 33-1377. Marijuana is classified as a controlled substance in Arizona. See A.R.S. § 36-2512. If the tenant is a cardholder, that fact alone does not permit eviction. Pursuant to A.R.S. § 36-2813, a landlord cannot refuse to lease a property, or evict a tenant, based solely on the individual’s status as a medical marijuana cardholder. Furthermore, if an approved dispensary is not located within 25 miles of the property, a cardholder is permitted to personally cultivate up to 12 plants. On the other hand, the Arizona Revised Statutes do not protect a tenant’s cultivation of marijuana in a rental property. See A.R.S. § 36-2814(A)(2). Accordingly, while a tenant cannot be evicted solely because of his or her status as a cardholder, there is no prohibition against eviction on the basis of cultivation of marijuana in the leased premises. Therefore, absent new legislation or regulations to the contrary, a landlord may evict a tenant for the cultivation of marijuana on the leased premises, even where the tenant is a cardholder. The should immediately notify the landlord of the tenant’s cultivation of marijuana on the leased .